The plated and horned groups of dinosaurs developed some impressive features. They had great frills edged with studs and spikes, around their heads, or triangular plates of skin and bone along their backs. Some were used in fighting. But experts believe that some dinosaur features were just for display. Like a peacock’s colourful fan of feathers, a male Pentaceratops’s head frill may have been used to help it attract a mate. Which dinosaur had the spikiest frill? 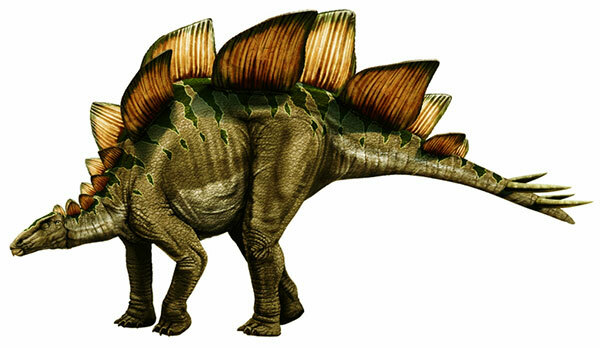 Styracosaurus was one of the most spectacular looking of the horned dinosaurs. Its head broadened into a large frill that covered the back of its neck. Six long spikes flared from the top of the frill, and the sides were edged with studs. 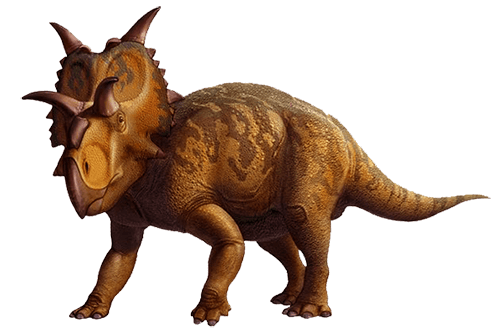 Styracosaurus also had a big horn on its snout, but seemingly no horns above its eyes. Could a skull be a battering ram? 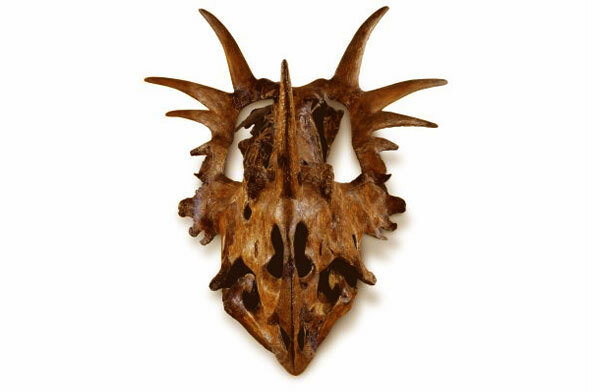 Triceratops, or “three-horned face”, had a short nose horn and two longhorns above its eyes. Its neck frill was edged with bony studs. 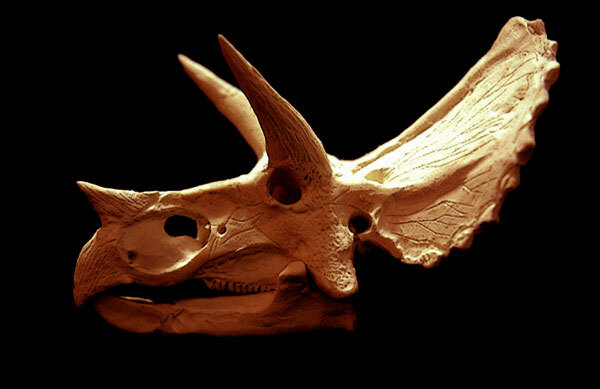 About 50 Triceratops skulls have been discovered, and many of them show scarring. This is strong evidence that the dinosaur used its tough skull as a weapon against larger predators. Did horned dinosaurs fight each other? The horned dinosaurs would have fought of attacking theropods, but they probably also clashed with each other. They may have crashed their heads together, damaging each other’s frills with their horns and spikes, or locked horns and shoved. Such battles would have been fought over territory or potential mates. What were Stegosaurus’s plates for? The bony plates running along Stegosaurus’s back were almost certainly not weapons. Experts think they were covered in skin, making them quite soft, with blood vessels (veins) inside. If this is correct, the plates may have helped to regulate body temperature. They would have absorbed the Sun’s heat, warming up Stegosaurus. Which dinosaur had a main sail? 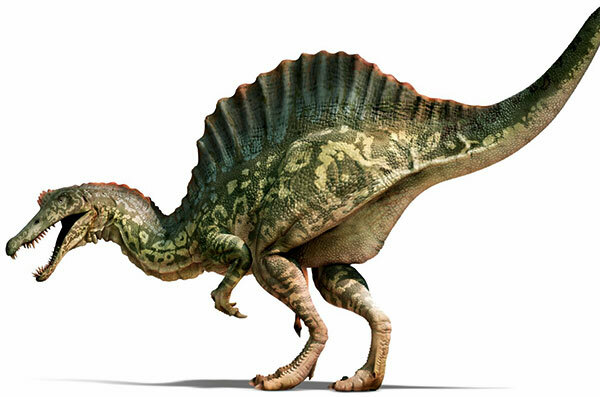 The big carnivore Spinosaurus had spines up to 2m (6ft) long along its back. These were connected by skin, making the feature look like a sail. This sail may have helped Spinosaurus keep cool in the hot African climate, or simply been used for display – to attract a mate. The plant-eating dinosaur Protoceratops had a neck frill, but the males had much bigger frills than the females. This supports the idea that frills attracted females. The head of Styrasocaurus was taller than an average-sized man! Some dinosaurs, including Stegoceras, had bony thickenings on their sculls. They were too fragile to provide self-defence, and were probably used to attract mates.